Sarah Street's illuminating study is the first to trace the history of colour in British cinema, and analyses the use of colour in a range of films, both fiction and non-fiction, including The Open Road, The Glorious Adventure, This is Colour, Blithe Spirit, This Happy Breed, Black Narcissus, The Red Shoes, The Tales of Hoffmann and Moulin Rouge. Sarah Street's illuminating study is the first to trace the history of colour in British cinema, and analyses the use of colour in a range of films, both fiction and non-fiction, including The Open Road, The Glorious Adventure, This is Colour, Blithe Spirit, This Happy Breed, Black Narcissus, The Red Shoes, The Tales of Hoffmann and Moulin Rouge. How did the coming of colour change the British film industry? Unlike sound, the arrival of colour did not revolutionise the industry overnight. For British film-makers and enthusiasts, colour was a controversial topic. While it was greeted by some as an exciting development – with scope for developing a uniquely British aesthetic – others were deeply concerned. How would audiences accustomed to seeing black-and-white films – which were commonly regarded as being superior to their garish colour counterparts – react? Yet despite this initial trepidation, colour captivated many British inventors and film-makers. Using different colour processes, these innovators produced films that demonstrated remarkable experimentation and quality. Sarah Street's illuminating study is the first to trace the history of colour in British cinema, and analyses the use of colour in a range of films, both fiction and non-fiction, including The Open Road, The Glorious Adventure, This is Colour, Blithe Spirit, This Happy Breed, Black Narcissus, The Red Shoes, The Tales of Hoffmann and Moulin Rouge. Beautifully illustrated with full colour film stills, this important study provides fascinating insights into the complex process whereby the challenges and opportunities of new technologies are negotiated within creative practice. The book also includes a Technical Appendix by Simon Brown (Kingston University, UK), which provides further details of the range of colour processes used by British film-makers. How did the coming of colour change the British film industry? Unlike sound, the arrival of colour did not revolutionise the industry overnight. For British film-makers and enthusiasts, colour was a controversial topic. While it was greeted by some as an exciting development – with scope for developing a uniquely British aesthetic – others were deeply concerned. How would audiences accustomed to seeing black-and-white films – which were commonly regarded as being superior to their garish colour counterparts – react? Yet despite this initial trepidation, colour captivated many British inventors and film-makers. Using different colour processes, these innovators produced films that demonstrated remarkable experimentation and quality. Sarah Street's illuminating study is the first to trace the history of colour in British cinema, and analyses the use of colour in a range of films, both fiction and non-fiction, including The Open Road, The Glorious Adventure, This is Colour, Blithe Spirit, This Happy Breed, Black Narcissus, The Red Shoes, The Tales of Hoffmann and Moulin Rouge. Beautifully illustrated with full colour film stills, this important study provides fascinating insights into the complex process whereby the challenges and opportunities of new technologies are negotiated within creative practice. 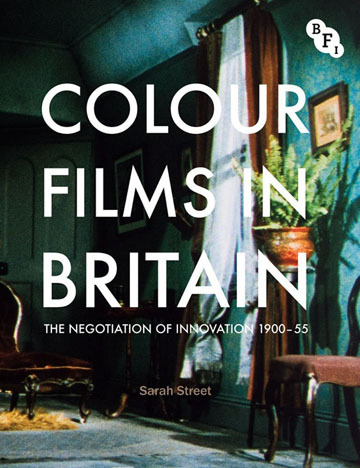 The book also includes a Technical Appendix by Simon Brown (Kingston University, UK), which provides further details of the range of colour processes used by British film-makers.